Hacker vs Robots Practice your typing skills as a hacker that is under attack by murderous robots. Hacker vs Robots is a fun sci-fi touch typing game. In each level you’ll encounter many different types of evil robots, ranging from spider crawlers, flying droids, and bionic walkers. 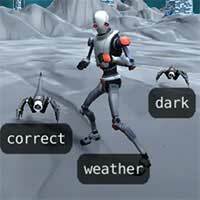 Launch missiles to by typing out the words responding to each advancing robot. YOu only have four lives so keep your fingers tapping. There are 5 different levels. Every Time you play word are randomly generated so you can practice as much as you want without getting bored. Is your fingers fast enough to defeat the robots? Enjoy it on Creetor.